I had to set the book aside, stomach tied in knots, pulse quickening. I had to stop reading this. But it was no use. It was like coming around a bend to find a gaggle of people and cars gathered at irregular angles, EMT’s surrounding somebody on the ground — any evidence of the “Jaws of Life” being used? — people sitting on the curb, head in hands, was that blood on that bandage? Yes it was like that. You have to look, while a quiet whistle escapes from deep inside, maybe one last glance as you slowly pass by. I couldn’t put the damn thing down. It was the inevitability of the spiral down into ruin and madness, as though it was written in the big book, and Charlton Heston, in a bad white wig, says, “Make it so!”…down, down, and down it goes. It was a time when we were devouring anything with the word “sail” in it when Marce unearthed “Last Voyage” by Ann Davison from deep in the dusty back shelves of Carnegie Library in Pittsburgh. Frank Davison created an airline, sold it, bought a sheep farm, sold it, bought a boat, a large wooden boat, and the spiral is engaged. You see the train coming, he sees the train coming; can he cheat the reaper? Charlton Heston lifts his stick and says, “Make it so!” Down, down, into insanity and death. Was this a metaphor for what I was doing to my family? We had made our deal with the devil, and the devil turned out to be…well, The Devil. 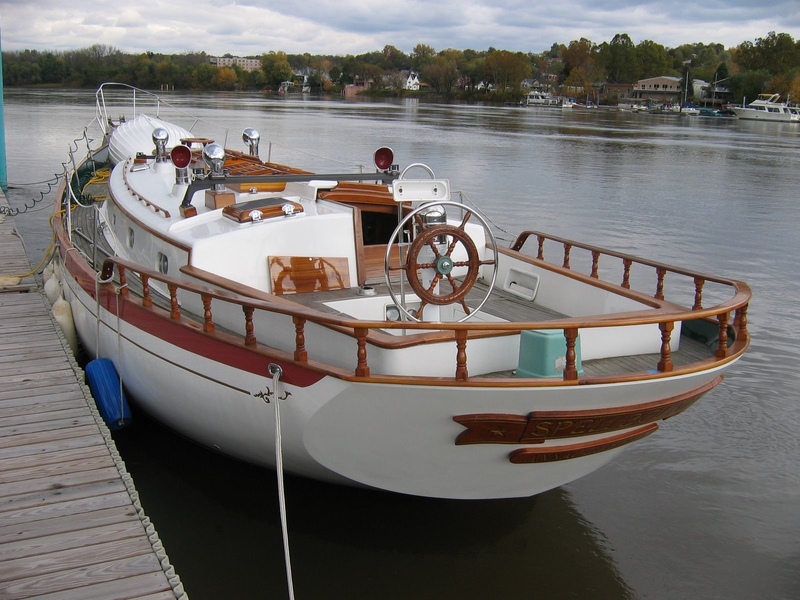 After a jury trial in Alabama, two years of our lives, and all our begged, borrowed and earned funds, we were left with a beautiful Luders-designed hull, a deck at maybe 50%, an interior at 20%, and a semi confident owner who was just stripped of the semi part. After lavishing sweat, time and money on our house it was time to pump up the boat kitty with the sale of our safe harbor, which sold in a day. No boat, no harbor. Marce says it’s time for a catamaran so watch this space for a serious boat buying expedition to Florida.